Titan may have a home-baked atmosphere. Saturn’s largest moon gets some of its thick atmosphere by cooking organic molecules in a warm core, a new study suggests. The decay of radioactive elements may warm Titan’s core from within, splitting nitrogen and carbon off from complex organic molecules. Once free, those elements can recombine into nitrogen and methane molecules and escape into the atmosphere. That process may account for about half the nitrogen and all the methane observed in Titan’s atmosphere, cosmochemist Kelly Miller and her colleagues report January 22 in the Astrophysical Journal. 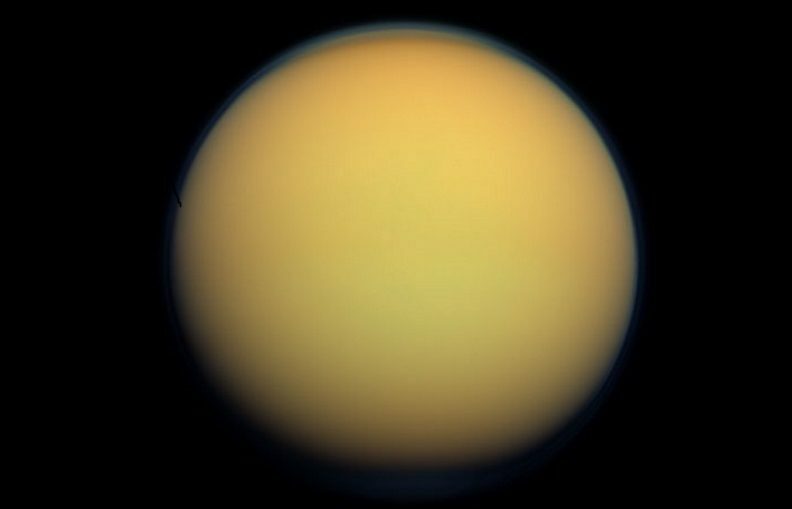 Where Titan’s thick, nitrogen-rich haze comes from has long puzzled planetary scientists. Other moons are too small and cold to shroud themselves in gas. “Titan’s the only moon that has an atmosphere,” says Miller, of the Southwest Research Institute, based in San Antonio. Previous studies suggested that Titan’s nitrogen could have been delivered in the ammonia ice of comets. That ammonia could be split apart by sunlight or broken up by the force of a comet striking the moon’s surface, creating the gaseous nitrogen molecules that fill Titan’s skies. But those studies came before the European Space Agency’s Rosetta mission, which orbited comet 67P/Churyumov-Gerasimenko from 2014 to 2016 (SN Online: 5/27/16). Rosetta showed that the comet was about 25 percent organic matter by weight, much more than scientists had assumed. It also contained radioactive elements such as potassium, which decays into argon — another element found in Titan’s atmosphere. 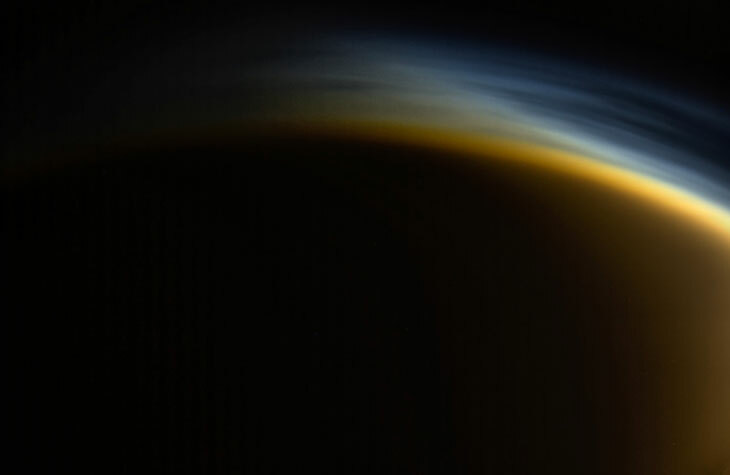 FROM THE INSIDE OUT Titan’s atmosphere (individual layers of haze shown in this image from the Cassini spacecraft) is made mostly of nitrogen. “I still had this conception that comets are mostly ice with a little bit of rock,” Miller says. “I was surprised to see that 50 percent of 67P was rock and organics, and only half was ice.” Ammonia from comets could still donate nitrogen to Titan’s atmosphere, Miller says, but she wondered what role those organics might play, too. In the new study, Miller and her colleagues figured that comets were likely building blocks for Saturn’s moons, since the Saturn system is so cold. The researchers assumed that Titan’s core was originally a sort of snowball built from comets. Given the insights from 67P, the team calculated what ingredients Titan would have started out with, and how those ingredients could change with time. The idea that Titan bakes organics in its core raises hope for the possibility of life on the moon, says planetary scientist Alexander Hayes of Cornell University who was not involved in the work. Titan’s thick atmosphere — plus a subsurface ocean, a hydrologic system of hydrocarbon lakes, rivers and rain (SN Online: 12/8/17), and a veneer of organic compounds and other life-friendly molecules — make the moon a popular target in the search for alien life (SN: 9/2/17, p. 12). So far, organics have been detected only on Titan’s surface. But hints that organic compounds may exist in the core means that the molecules may also exist at the bottom of Titan’s subsurface ocean, an environment that could be a cozy cradle for life, Hayes says.